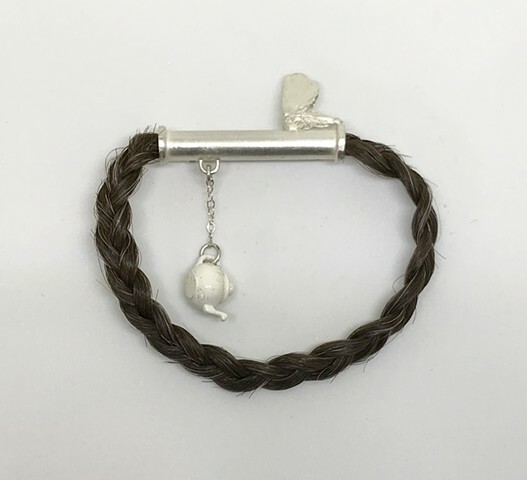 Tangible Hope is a series of compelling and evocative wearable objects of contemplation that utilize visual metaphor and material exploration to focus on concepts of loss of innocence, fear and hope. With fear ever present in our “Age of Terror”, I find myself looking for hope. This searching has led me to examine objects from the past, from the history of jewelry and metalsmithing, such as amulets, talisman, Memento Mori (symbolic reminders of mortality), and medieval reliquaries. I have also been drawn towards imagery I associate with a nostalgic longing for childhood innocence. The materials chosen for these objects have a profound impact on the content of the work, for example, hair (from my youth, my daughter, my mother), bone, and childhood toys. Since the beginning of human civilization, we have created objects during times of fear and uncertainty in an attempt to embody hope. These objects are my attempt to make the intangible tangible.